Your heart rate rises, your legs burn, and some say it's the best workout they've ever done -- on a trampoline! Leslie Jones bounced her way to such major results that she shared her secret and Dena Arevalo joined the workout last month. "I've actually gotten into a pair of jeans within the past three weeks that I haven't gotten into in year. So, I was really excited. I'm just coming twice a week," she says. You usually don't think of men in an aerobics class, but this is AIR-obics. "People think it's for girls, but when guys get out there and start jumping, they do have a lot of fun. It's a good core exercise," says Alex Lippke, adding that you use every muscle. 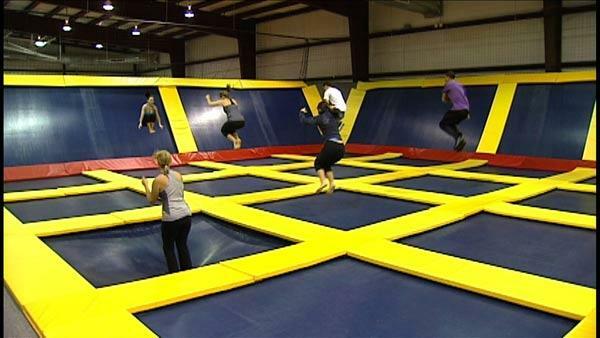 AIR-obics is an hour-long, low impact fat burning workout on large trampolines. It's four segments broken up with a three-minute water break. "The trampoline itself absorbs 80% of the shock, and it's a great way to have a low impact workout but still have the cardiovascular benefits of a traditional running, or any other organized exercised class," says instructor Jenny Gaal. "I've had seven year-old to 72 year-olds. You can burn up to 1,000 calories, depending on how hard you push yourself," says instructor Jenny Gaal. Want more wear out of your wardrobe? Make your closet 'seasonless' by transition dressing! Is losing your hair making you lose sleep? Try these hair growing and hair thickening solutions! You spent hours figuring out which dress to wear -- don't ruin your ensemble with the wrong makeup! Turns out, there's a face for every frock.